We have been to Regis Marcon many times, but since our last visit he has received 3 stars and has created a new gastronomic restaurant. The original restaurant in the hotel is now a bistro. 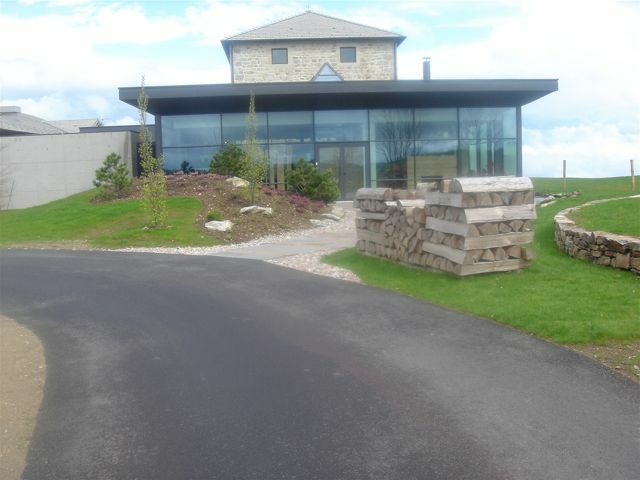 The new restaurant is brand-new (opened Oct. ’05, closed for the winter and re-opened for the ’06 season in April). The restaurant over looks the whole valley. In many respects it reminded us of Bras without as much futuristic “space-ship” feel. The view is magnificent. The tables are big and well spaced. Although the restaurant setting was new, we knew we were “home” at one of our favorite places. We had been expecting Marcon to get the 3rd star for several years. We were also at home because the sommelier, Laurent, assisted us in every aspect of ordering wines and making sure that our service was excellent. 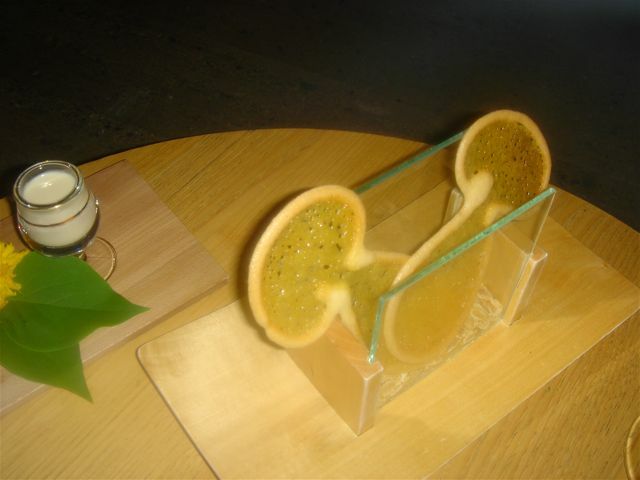 We remember Laurent from his first year, 2001, when he impressed us. We knew he was young to be head sommelier at a 3 Star—now 29—ironically born 1977, one year after our son, on exactly the same day, April 19….amazing coincidence. The server arrives with a wooden box on the top of which is a small woodpecker. 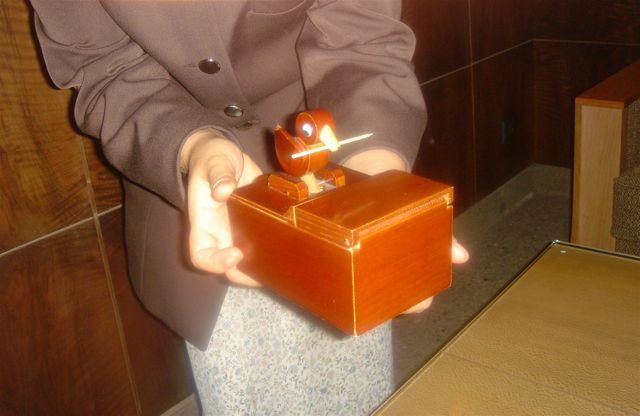 With a pull of its tail the box opens and the bird grabs a toothpick. You take the pick and stab your beignet. Regis Marcon discovered these in Japan—naturally we had to have one and I do! 4. 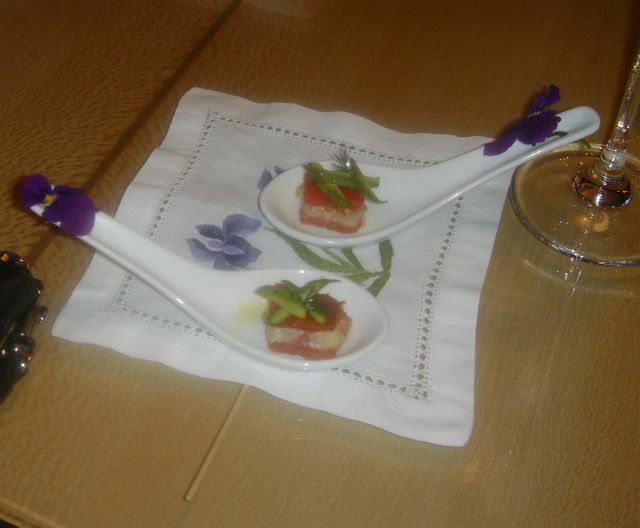 In a Chinese spoon, cold potato puree with coquillage (shellfish) topped with some type of cheese. 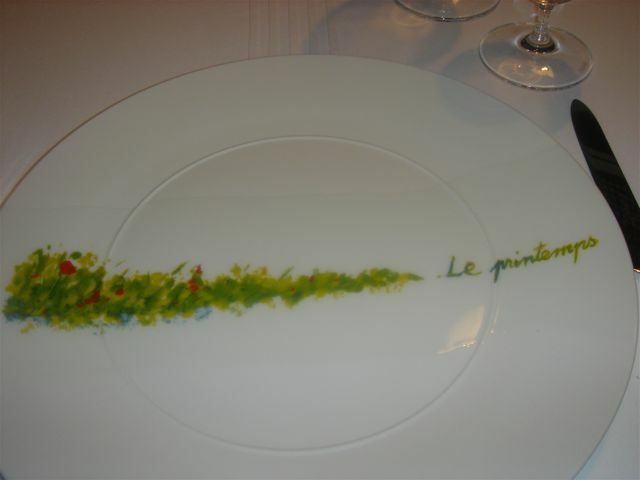 Regis Marcon has special plates for each season. 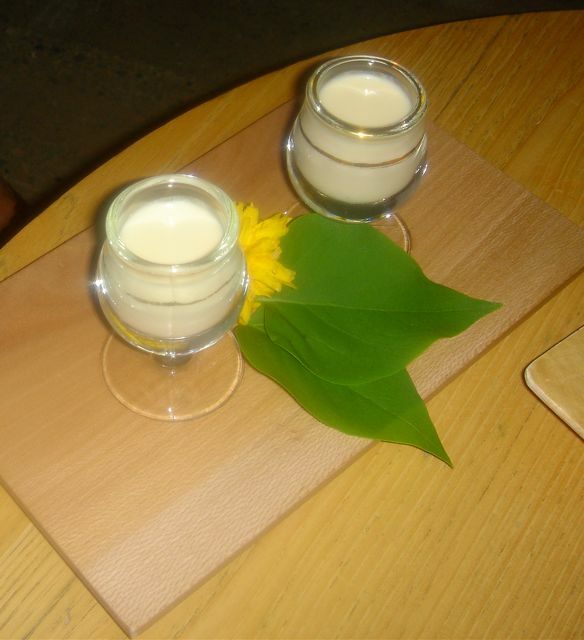 A tall glass of a “cocktail of legumes” — cream of celery, peas and tomato. 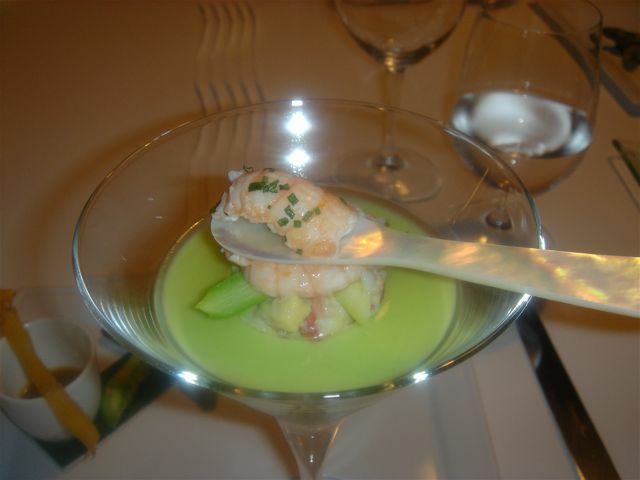 Transparence d’ecrevisses au pamplemouosse rose, crème d’ asperges et des beignets croustillants—served in a martini glass, bottom layer of asparagus cream, then on top peas and a 1/4” dice of avocado and pink grapefruit and its gelee, topped by small, whole crayfish. 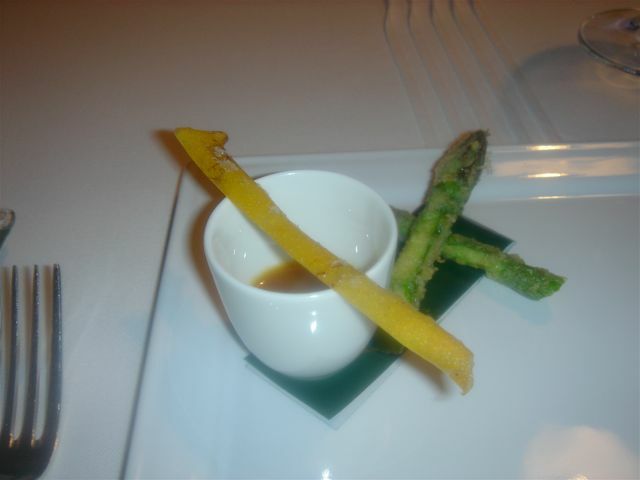 In another dish, 2 tempura asparagus spears with some type of vinegar sauce for dipping. This was an excellent dish—an ode to spring—light, refreshing, well conceived and well executed. Terrine de ris de veau et morilles noires, petites salades de champignons et aigre doux. 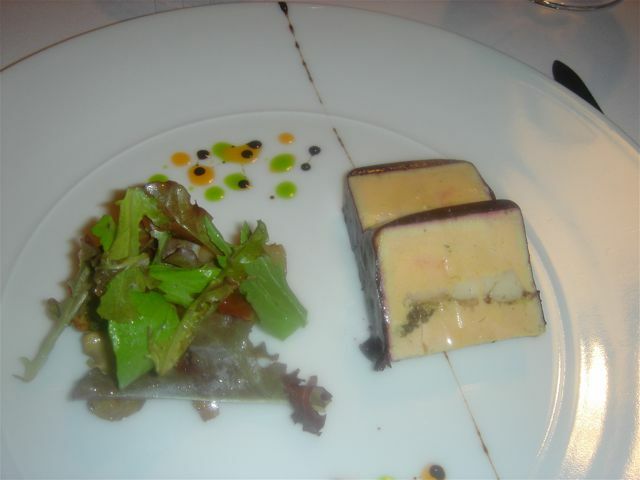 Foie gras and sweetbread terrine with wild mushrooms. Superb! The center of the terrine had the sweetbreads and morels surrounded by the foie. This addition added excellent texture as well as taste. Dos de Sandre a l’ail des ours et mousserons—fresh water pike-perch sat on top of shallots, spring garlic and some of the mousserons (small wild agaric mushrooms). More mousserons topped the sander and ringing the plate at the top mashed potatoes. Another winner—maybe not the wow of some other restaurants, but fresh ingredients handled expertly. 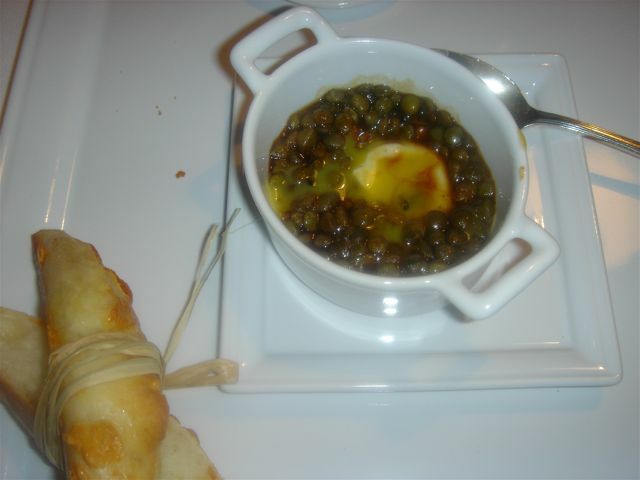 A special gift from the chef—a mini rendition of his lentil ragout with slices of black truffles and a slightly poached quail egg. 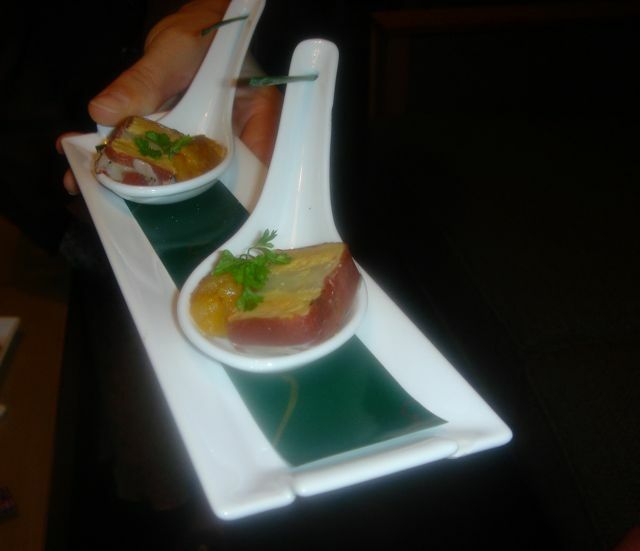 We love this dish. Le couchon de lait aux cerises, la coterote au sautoir, boudin et cervelas aux cepes. This was absolutely spectacular. 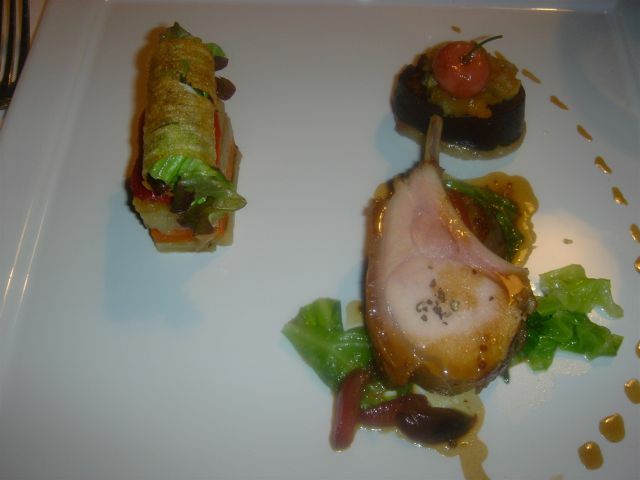 Suckling pig chop with a cherry-based jus, a millefeuille of the liver with cepes and a boudin on toast point topped a cherry. 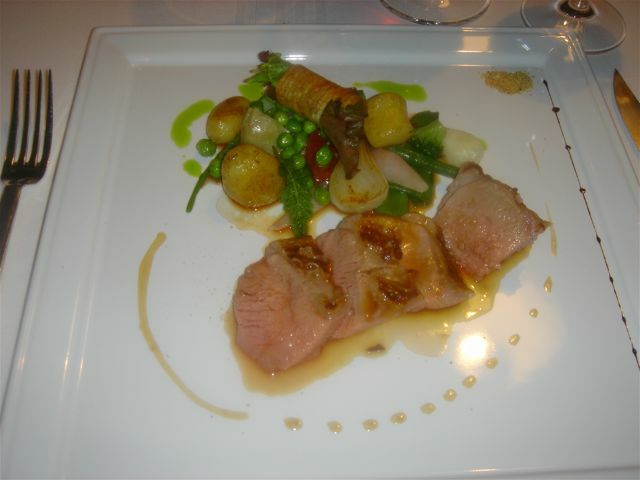 This was a 3 star-signature dish. 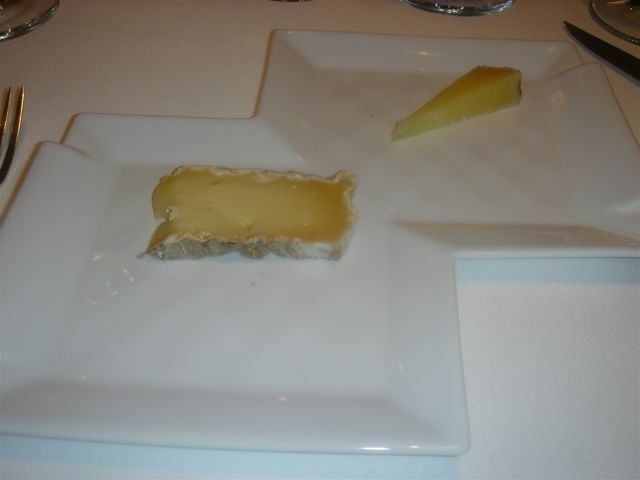 A huge selection of cheeses from the cart—I only took only 2 – John 3…but I was taken by the cheese plate itself. It is made by Revol (France tous les trios design). 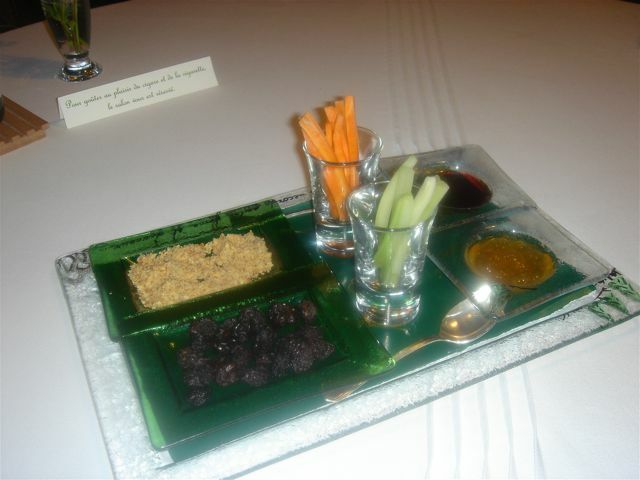 We both thought the additional vegetable/nuts/jam presentation with the cheese, particularly celery and carrots was unnecessary. The raisins, orange marmalade, oats/cereal and strawberry compote just did not make sense. 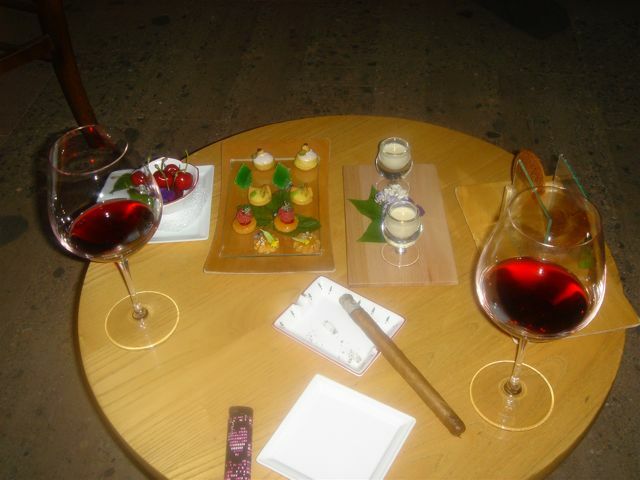 We passed on dessert to have coffee, mignardises and a cigar in the lounge. They were packed. You would think it was some sort of a bargain deal. 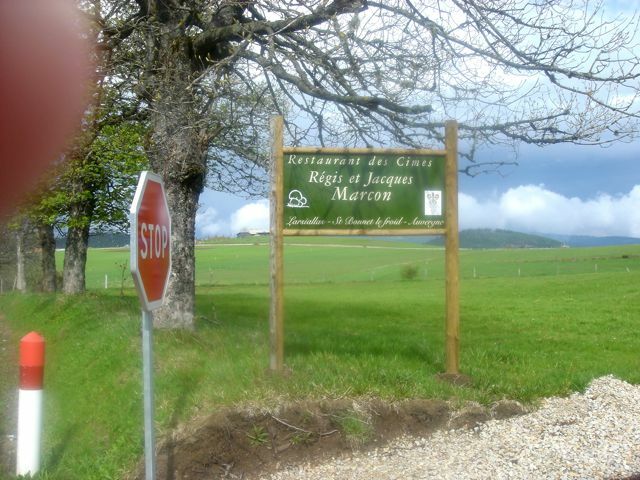 It seems that families from the surrounding area flock to Marcon for Sunday lunch. The private dining room was full. There were large tables (8’s) all over the dining room. There wasn’t one empty table to be seen and all the lounges were packed with guests going in or out. 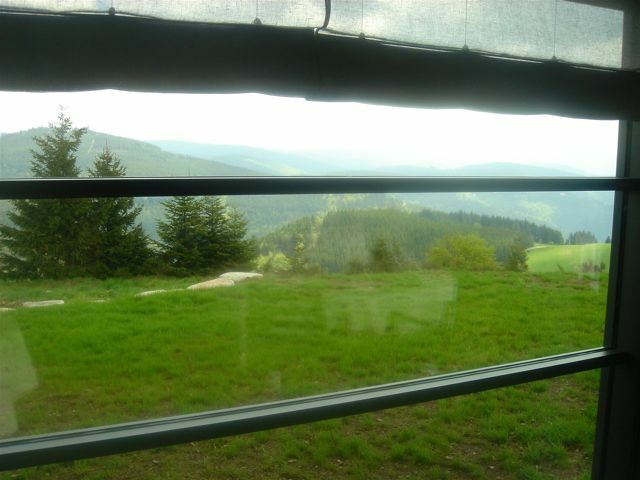 View from our window seat. In retrospect, we will not do the Sunday lunch in the gastronomic restaurant. Service really suffered although Laurent made a valiant effort. Since we were having dinner at 8:30 that evening and lunch was at 12:30, we decided to keep it light. 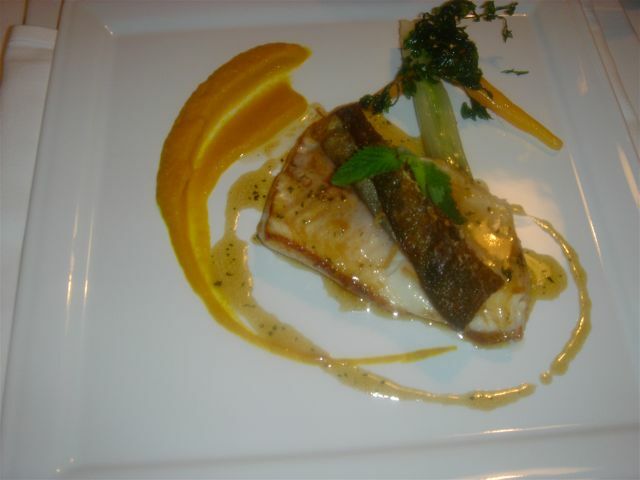 5. trout escabeche with a tart of cheese mousse. 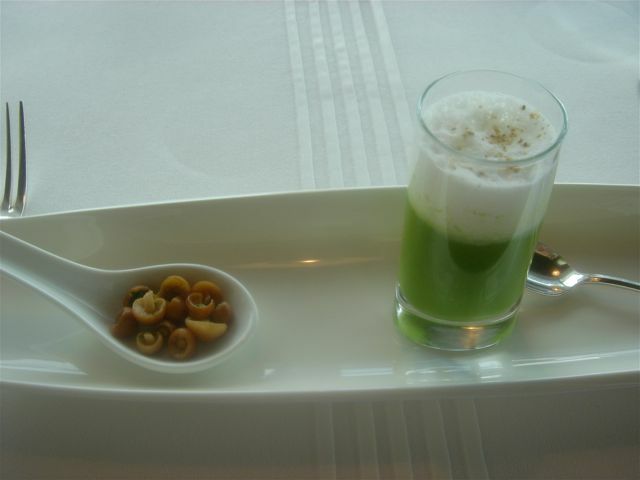 Amuse at the table: In a tall shot glass, a bottom layer of hot pea soup with whole small pea and on top a white foam “liquor” of herbs. To the side a small spoon of fairy mushrooms marinated in very light oil. 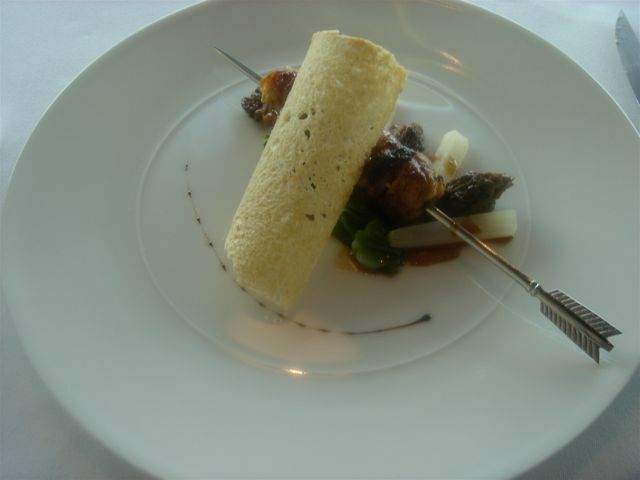 1st course: La Brochette Margarrdou version 2006, ris de veau, jambon, morels, brioche leaf —on a silver skewer, a croquette is presented that is filled with lamb sweetbreads, morels and ham. Saucing was a mushroom-based cream-enhanced stock. The brochette sat on greens, to the right were morels, to the left spinach and endive. 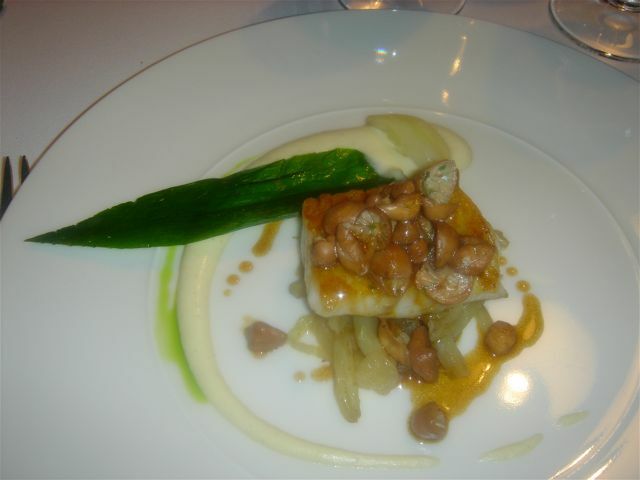 This is a old favorite that was a good as ever—a 3 star signature dish. 2nd course: La vraie crique ardechoise aux langoustines, legumes sautés a cru aux calamars—this dish didn’t work. We might have upset the balance of the dish by splitting it. There were way too many vegetables relative to the langoustines. 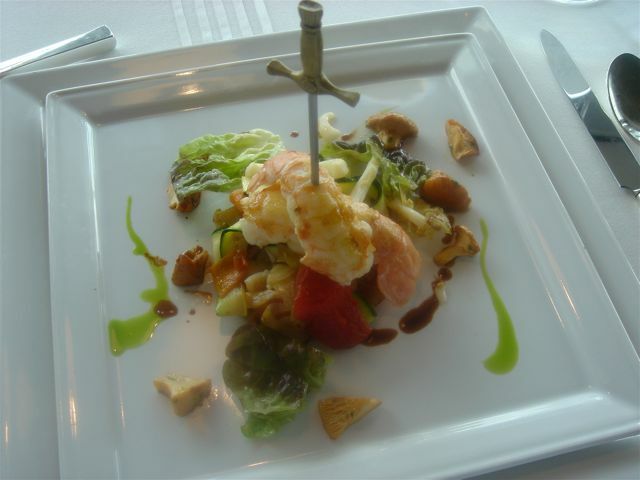 The langoustines and the veggies sat on a soggy potato pancake. Our tasting menu the night before was far superior to this meal. This was more like a 1.5 star dining experience…we were concerned about going back for dinner in a few hours—what a problem!! We returned to a full but not jam-packed dining room. 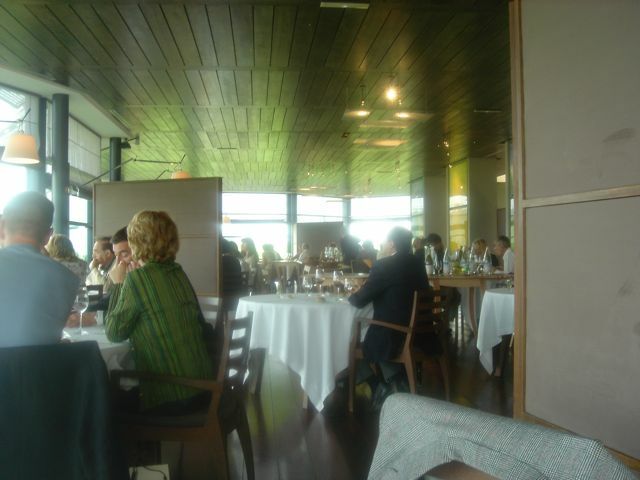 Most of the tables were 2’s and the private dining room was dark. 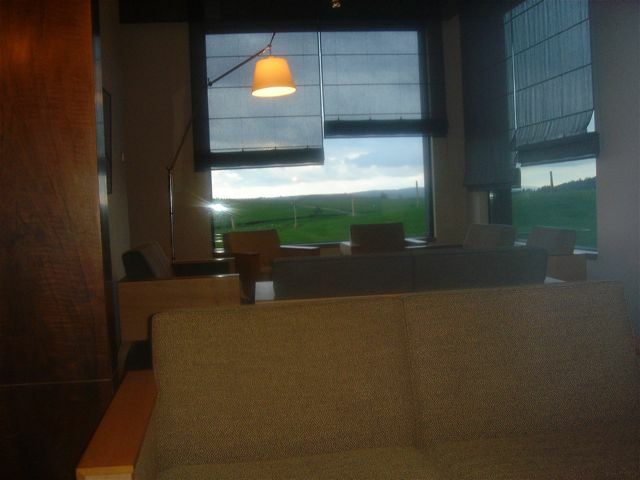 The entire feel of the restaurant was completely different — calm, leisurely, and peaceful; the Marcon we know and love. It seems the above 3 amuses are the standard beginning in May. The winner was definitely the beignet. 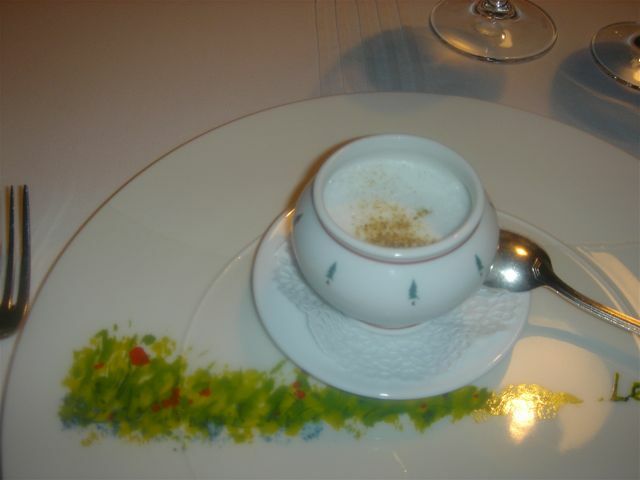 Amuse at the table: Crème de Champignons—this had absolutely no relationship to USA mushroom soup. 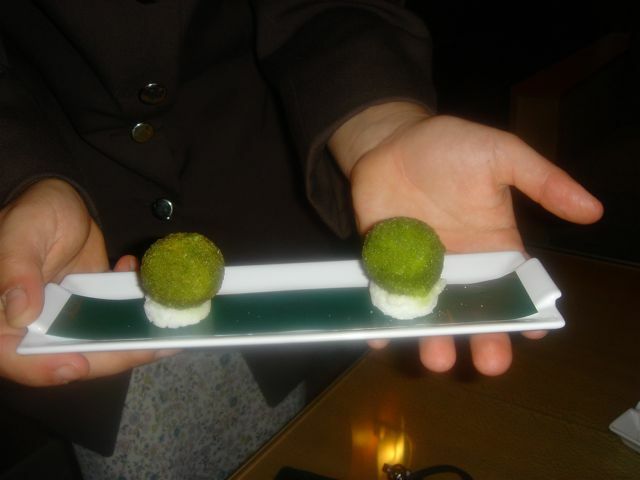 It tasted “of the forest” because the chef had foraged the mushrooms probably that morning. Marcon is out at 6:00 AM every day…wonderful!!! 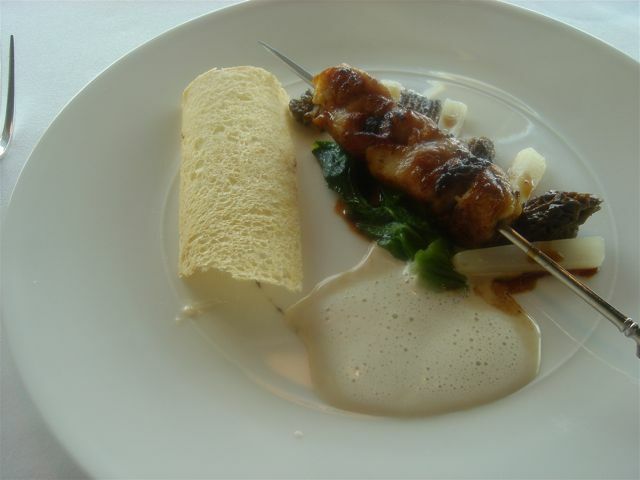 1st course: Les asperges aux morilles (morchella, conica, rotunda( with a light sabayon au gout (taste) de cepes. 4 asparagus spears were on the plate alternating green/white. A “pile” of morels were set at the stalk end. 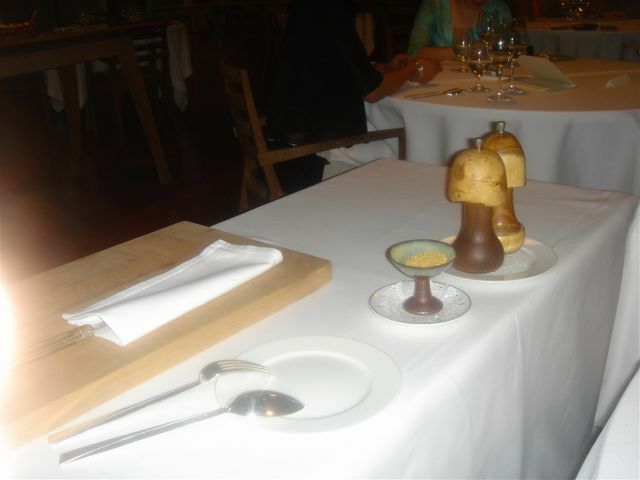 Then a bright yellow sabayon, intensely flavored, with cepes rings the right side of the plate. 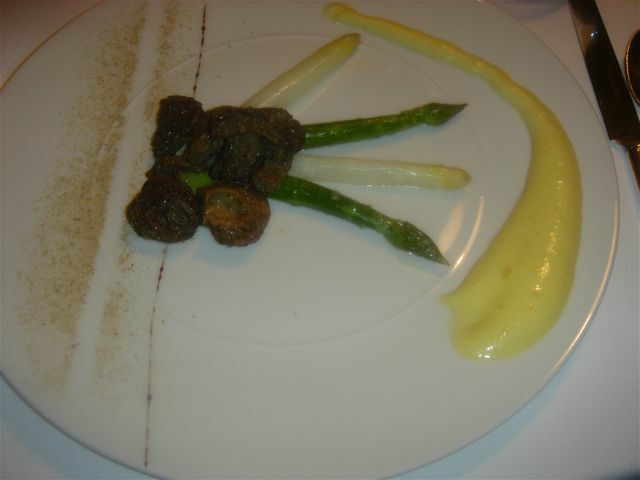 Who would think that asparagus and morels would produce such a heavenly dish. 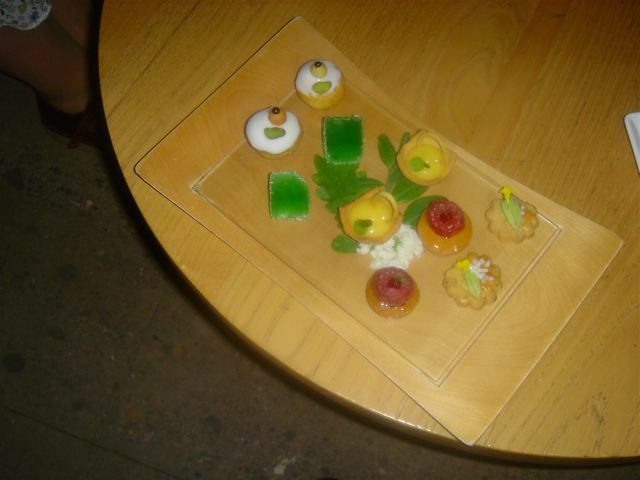 2nd course: Omble Chevalier etuve plat tout encontraste—jus, mousseline et sorbet. The fish was spectacular, cooked perfectly with the skin of the fish served separately—crispy and filled with shoestring potatoes and shallots. 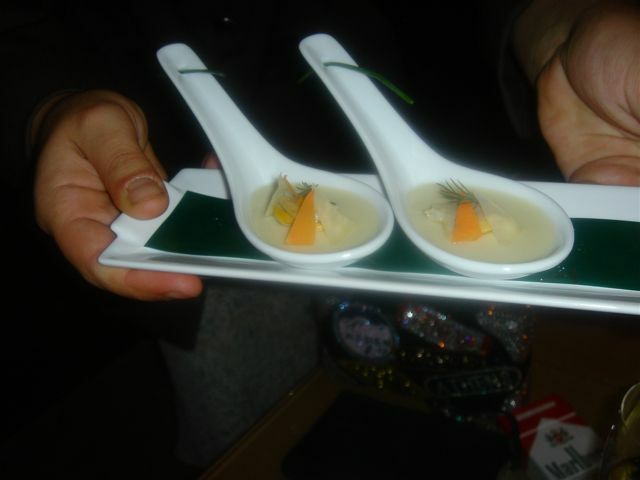 Carrots and fennel were to the right of the fish and a carrot mousse served as a sort of saucing. 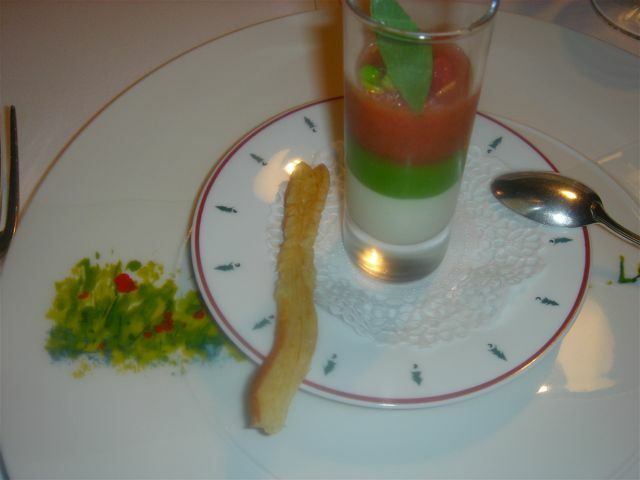 The “plat in contrast” refers to the fact that the sorbet, jus and mousseline had the same spicing. You tasted the seasonings in 3 different forms. Another winner. 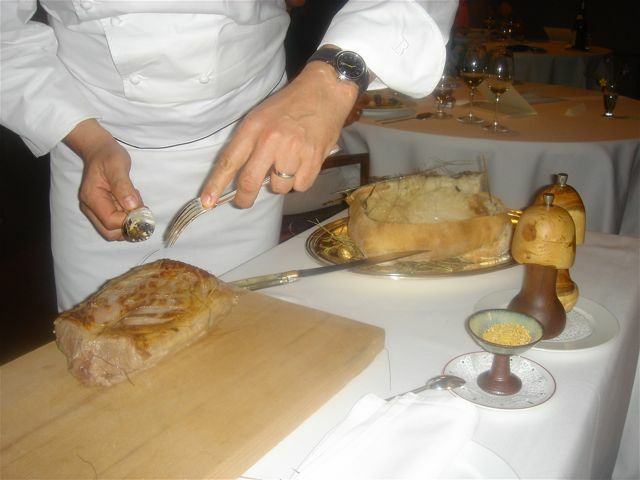 3rd course: La selle d’agneau de sauges cuit en croute de soin de cistre, epices au loup. 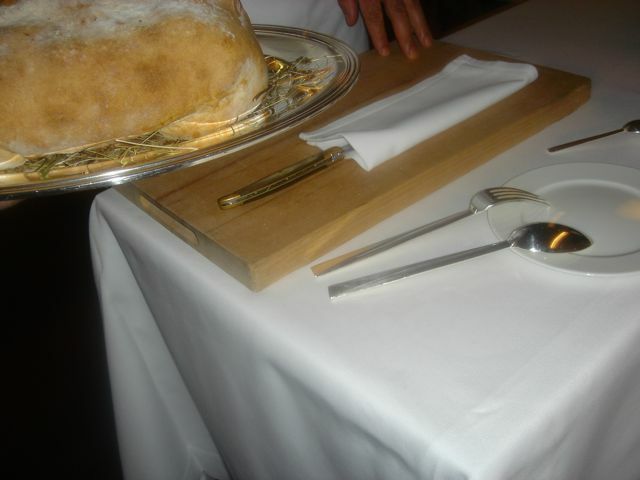 A small table is set up next to your table. Regis Marcon comes out of the kitchen. 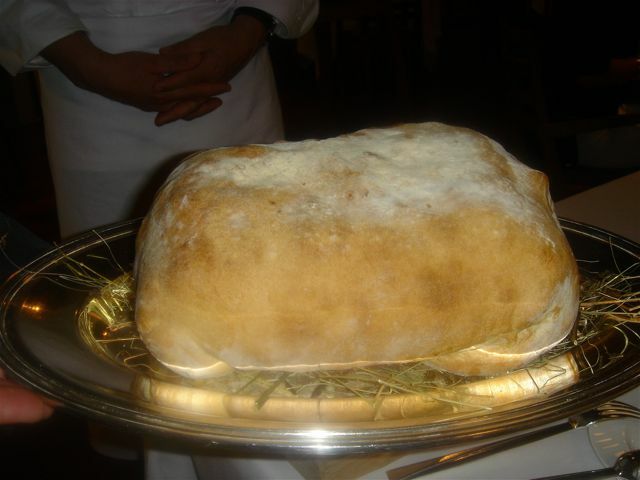 The staff presents him with what looks like a huge loaf of bread. 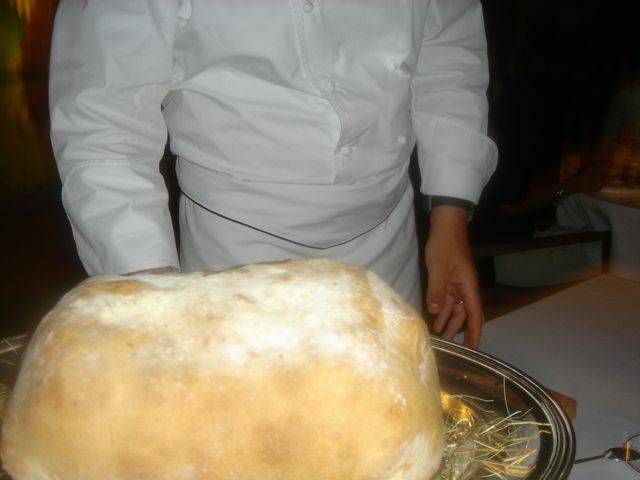 Chef Marcon cuts around the base of the bread and inside sits the lamb covered with hay. The lamb had indeed been cooked in hay. 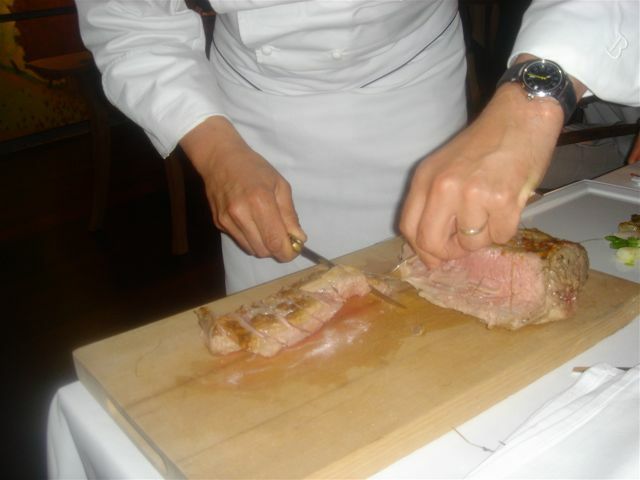 Carefully, the chef removes the lamb and turns it one way then another until he finds exactly the right place to slice. 4 perfect slices of rosy lamb are presented with a medley of spring vegetables—broccoli florets, fingerling potatoes, peas, pea pods, artichoke heart, turnip, zucchini, spring onion, and baby asparagus. On top of the vegetable medley is a fried potato filled with lettuce. 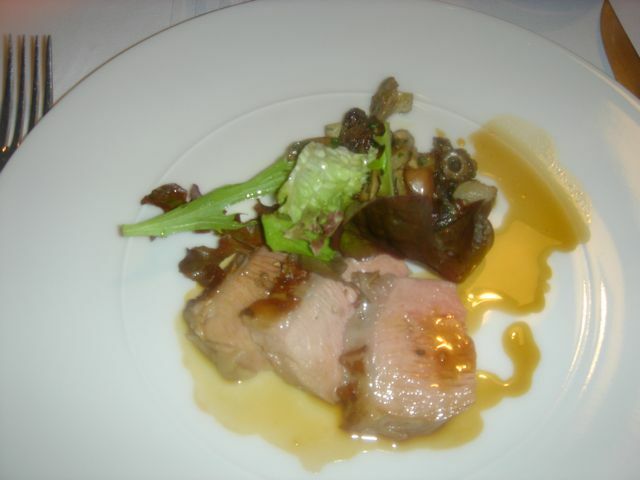 Second service of the lamb is served with a medley of mushrooms. 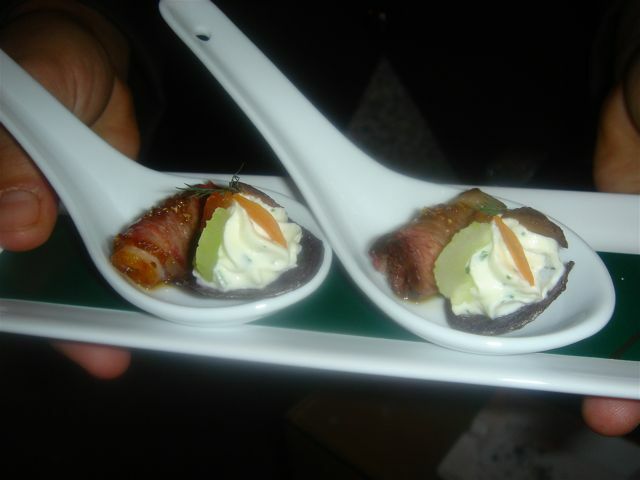 Mushrooms really are the king at Regis Marcon. 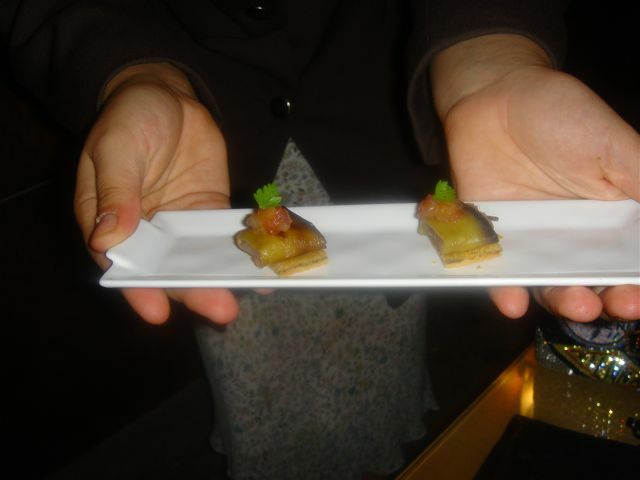 This is a wonderful dish that we enjoy our last night every visit. It is enough to bring us back in a few years along with fabulous sommelier Laurent and a very beautiful, relaxing setting for the weekend. The only change big changes…we are looking forward to a new hotel with more luxurious rooms. The current rooms are looking shop worn. Also, we’ll go to the bistro for Sunday lunch and avoid the 1.5 star food and service. 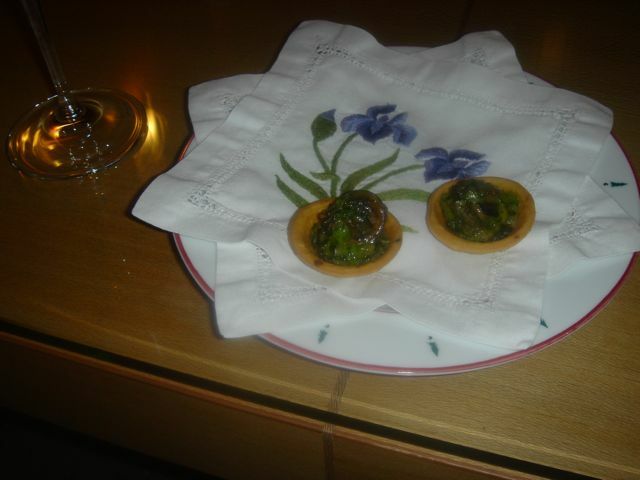 We again skipped dessert and had mignardises, coffee and John’s cigar in the lounge. How to rate Regis Marcon. The two dinners were certainly 3 star. The one lunch was no more than 1 star. We would definitely go back. Laurent is one of the best sommeliers in all of France. He always finds reasonably priced “goodies” for us. It is a great spot and they are lovely country people with great hospitality.